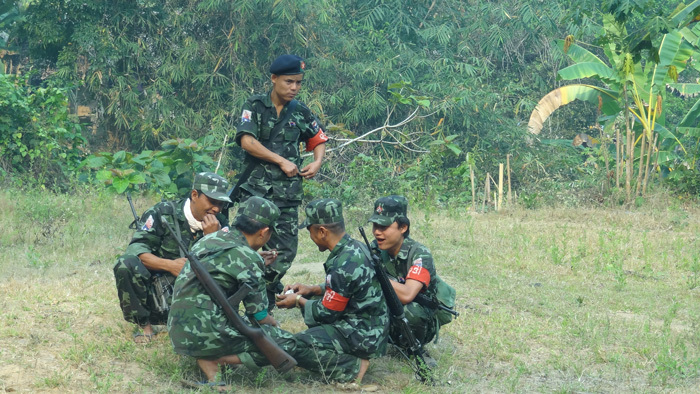 Fighting broke out between troops from Karen National Liberation Army and the Burma Army in Ler Mu Plaw village tract in Papun (Mutraw) District of Northern Karen State on March 6. The clash caused thousands of villagers in the areas to flee. Padoh Saw Gaw, a standing committee member of the Karen National Union’s Mutraw district confirmed to Karen News that fighting took place. According to Karen News sources from Mutraw district, the fighting broke out as the Burma Army advanced into KNU controlled areas and began to build road access to their military camp. Padoh Saw Robin Moo, secretary of Mutraw district told Karen News that villagers in the areas had fled their villages and are now seeking safety in other nearby areas. Padoh Saw Robin Moo told Karen News the Burma Army had targeted village lands. A local official who asked not to be named said the Burma Army aggression had caused displacement to residents of eight villages including; Tokho Mu Der, Gay Thoo Khi, Shoe Per Kho, Ler Mu Plaw, Loh Ko, Tha May Khi, Thay Thoo Khi and Bo Nar Der. The KNU’s Padoh Saw Robin Moo said that they have reported the incident to District headquarters in order to take steps that would prevent the situation from getting escalating. Colonel Myo Min Naung, security and border affair minister of Karen State said (on March 6) he has started a frontline investigation. “I haven’t received any detail information yet. I just heard about the incident. I am still making inquiry with Papun [officers].”. There had been four clashes between the KNLA and the Burma Army in Mutraw (Papun) district, since the beginning of 2018.